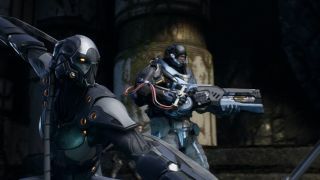 Paragon, announced a couple of weeks ago, is a new MOBA by Unreal Tournament creator Epic Games. New information is being revealed gradually as the game approaches its early access release, which is set for in the spring. There's been a first-look trailer (see above), a flashy cinematic (because every MOBA has one of these) and a steady stream of hero reveals (ditto). The third-person perspective and sci-fi arsenal are the standout features, here. Although neither are particularly new territory for Epic, only Smite has really tackled this genre from this perspective. Last week I spoke to Paragon's creative director, Steve Superville, about the line between shooter and MOBA, implementing old concepts from a new perspective, and the game's potential future as a competitive game. Steve Superville worked on both Counter-Strike and Condition Zero at Valve before joining Epic. He's worked on the entire Gears of War series, Unreal Championship 2, and Infinity Blade for mobile. PCG: Where is the balance struck between shooter and MOBA, presuming that you can put those things at either end of a sliding scale? Steve Superville: We are a MOBA. We aren't very shootery—the traditional things that are in shooters are missing. There's no infinite-range shots. 80-90% of the abilities in our game are projectile-based or body-based versus instant-traceable, line-scan stuff. It's much more about positioning and teamwork, like in a traditional MOBA, than it is about—you know—jump-180-no-scope headshots. We don't even have headshots in the game, currently. Maybe they'll come in later for a particular character. It's much more about heroes and abilities and team comp and itemisation, strategic opportunities on the map and controlling map space and the economy that goes with that. PCG: Presumably you've had to use some of the expertise you've developed as action game developers, though? SS: Yes. We've tried to bring our DNA of being action game developers into Paragon—not just controls but arena and ability design and all that sort of stuff. For the arena, we wanted to keep the MOBA feel and allow a lot of open lines of sight, because one of the exciting things about a MOBA is the ability to see the teamfight that's happening that I might not be part of. The map is designed to facilitate that, even though we have a third-person camera. The bases are set up high in the mountains, and there's kind of a bowl between them, so as you run down the mid lane, if your friends are having a teamfight on the other side of the valley, you can see it. The other thing we wanted to do was allow you to see from lane to lane. The top, middle and bottom lanes are actually, high—like, high up on the mountainside—and then there's a middle, and then there's a low, so you can look across them. The jungle goes down, it depresses between them, so there's a valley between each lane. That allows you that sense of being able to know what's going on in the map most of the time, and make decisions about where you should be, what you should be doing, and how your teammates are doing. PCG: You've spoken about visibility. How do you handle occlusion? How do you handle hiding people? That kind of deception and map control is important to all of these games. SS: There are a lot of occlusion elements in the map. The most obvious ones happen when you're down in the jungle. The canopy structure is between lanes, and you can actually just jump right down through it, and there's a maze-like, forbidding area. Just like in all the other MOBAs, the fastest way to get from point A to point B is often to transition through the unknown environment of the jungle. When it comes to sight lines between lanes, there are trees and there are rocks so the sight lines aren't perfectly unbroken. It's not a big open cornfield, or something like that. I'll just put it this way: ganks happen a lot. PCG: This is the first time you guys have made a game that isn't just on the shelf and done, but will have to be continually developed for a long time. What challenge does that pose in terms of making the game? SS: It's definitely a big mind shift for us. It's hard to shift away from boxed products. I'm excited about it because it means that we engage with our audience continually. As a designer, it's a fantastic place to be where we learn from the community and have the ability to make adjustments. One of the things that came up early in the project was how—I'm going to say this in the worst possible way—how poorly developers play their own games compared to the many people who play. When we launched Gears [of War] we thought the game was balanced, and within a weekend we stopped being the best players and shotguns dominated the entire game. That was an awesome and humbling experience. The idea of having a live game where we develop alongside partners in the community, and they teach us the best way the game is played, where it's great and where it's broken, is really exciting. That makes for the best product. PCG: Something that I find really appealing about this genre comes from the crazy systemic interactions between things. You're obviously making a game fresh, but do you still want to provide room for players to combine abilities or characters in unexpected ways? Or do you lock it down, when it comes to roles and so on? SS: No, that's definitely part of the design idea—to provide the community with a puzzle that is interesting and fun to solve, and then to see what they do with it and adjust from there. We've tried to take a twist on the traditional itemisation systems that are in other MOBAs and we've made a card system, the primary difference being that accounts will have different types of cards, different asymmetric collections of cards, and as you choose your character you build a deck from the cards you've aggregated. Then you bring that into the match and that deck is what populates your item store. We believe that the fun there is if you try to do something surprising, then I may not have brought the item that will counter that and mitigate the advantage you have. I feel like in traditional MOBAs that's much harder to do because everybody has access to everything all the time. Characters more quickly get put into a bucket where there are two, maybe three builds that are ideal and that everybody knows. What we're aiming for, and the community will let us know if we're successful, is to provide some more strategic choice. PCG: Can players see what other players have chosen in terms of their cards, their deck, and so on? SS: Much like current MOBAs, they can see what players have actually equipped if they have vision of that player, but they can't see the breadth of options that they brought in. Part of it is that cat-and-mouse game of thinking 'for the assassin'—and I'm making stuff up now—'the most common build is attack speed and lifesteal'. When I see you on the other side I'm thinking 'okay, I'm going to try to itemise or build a deck that counters that'. But you know that I know that, right? So you get into the chess match of planning, and it's made for some interesting opportunities. PCG: Presumably that closes off some options for steering your strategic approach mid game, because you're locked into the deck that you brought with you? SS: Yes and now. The size of the deck is meant to allow for you to have a particular plan and then have enough cards to adjust, where sometimes you use them and sometimes you don't. That's the design. PCG: What are your ideas for fostering a professional competitive community around the game? SS: The focus right now is to make a fun competitive game. We've had a lot of questions about e-sports and we're just not focused on it because we don't have players to show us if the game is really compelling and fun, what needs to change and what's broken—getting back to that Gears analogy of thinking things were balanced and finding out shotguns ruled all. Our job is to watch, listen, learn from them, and then adjust the game until it's really compelling and fun in their eyes, not just our own. PCG: So if there's a demand for it, it'll become a question for that time. SS: That's right. If the community says 'hey, we want to be hyper competitive' then we'll do our best to support that. PCG: Thanks for your time! SS: One last thing! We really want to engage with the PC community as much as possible, and players can go sign up at paragon.com for the beta.